Her most controversial tweets and famous followers, including Justin Bieber! Liza Soberano has gotten a lot of attention in the past years, mostly due to the fact that she is witty AF, she is refreshingly unreserved, and she has one of the most beautiful faces of her generation. But behind the camera, Liza has had her fair share of ~drama~, specifically in the Twitter world. The ABS-CBN actress has posted controversial Tweets, expressed her excitement over celebs following her, and defended herself and other people from bashers, to name a few. To recap the ever-dramatic world of Liza Soberano's Twitter account, here's a quick recap. "Oh my god!!!!!!!!!" was Liza's perfect reaction when international star Justin Bieber followed her on Twitter back in 2014. We would probably be floored, too! In 2015, another international singer and songwriter, Camila Cabello, started following Liza on Twitter. Liza posted the follow-back notification on her Twitter account, and wrote, "Oh my gosh oh my gosh imma faint right now." Cabello is best known for her hit single, "Havana." Remember that time in 2015 when Liza Tweeted that one of her favorite songs is "Can We Dance" by The Vamps, and one of the band members, lead guitars and vocals, James McVey replied with a lot of cute emojis? We can't forget either. This isn't exactly onTwitter, but James also posted on his Instagram account, @jamesmcvey, a photo of him and Liza when Liza went to The Vamps concert. James wrote, "You were so lovely @lizasoberano." UPDATE: On January 4, 2018, James greeted Liza on Twitter! He wrote, "Happy birthday to my lovely Filipino friend @lizasoberano!" Liza simply replied with a "Thank you James!" 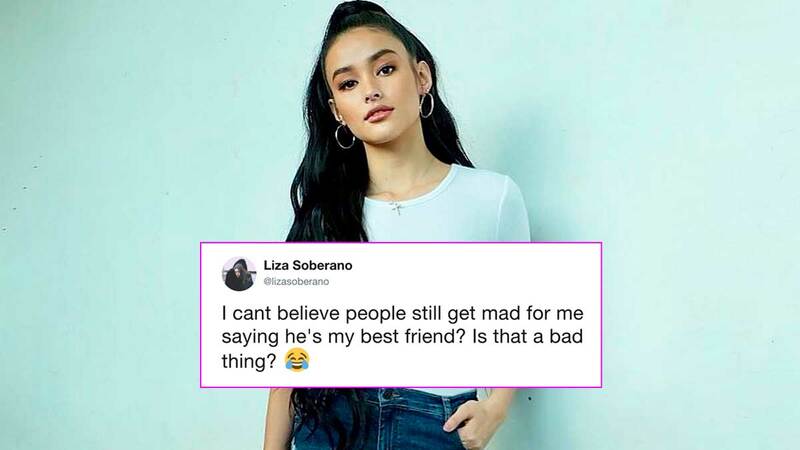 She Called Enrique Her "Best Friend"
In April 2016, Liza was bashed by some netizens for calling her love-team partner Enrique Gil her "best friend." Liza was quick to defend herself. "I can't believe people still get mad for me saying he's my best friend? Is that a bad thing?" Then she added, "Calling someone your best friend doesn't necessarily mean you are friend-zoning them. Things can develop, right?" We think she made the right prediction. In August 2016, while "Marvin Gaye" singer Charlie Puth was in the Philippines for his concert, he came across the movie Everyday, I Love You (2015), starring Liza and Enrique, being shown on TV. He then did some funny antics while the movie was playing and recorded everything on Snapchat. Later, he invited Liza to his concert but, sadly, she had to decline. In early 2017, Liza showed her love for the Netflix TV series 13 Reasons Why by reposting a teaser about the show. In April 2017, she tweeted, "Bullying and humiliating people isn't [sic] cool." When one fan assumed that she was talking about the show when she made her statement, Liza replied to the fan: "I finished the whole series. But I'm not just talk [sic] about 13 reasons why." Her reply caught the attention of actor Christian Navarro, who played Tony Padilla in 13 Reasons Why. Navarro then replied to her comment, "Well you're right Liza. Thanks for watching anyway." Liza, of course, couldn't help but fangirl over Navarro's tweet and ended up having a pleasant exchange with him. Liza replied, "Omg. Thanks for tweeting me!! I love thirteen reasons why!" Navarro tweeted back, "Thank you for watching the show!! I'm a fan." Liza was over the moon: "Are you serious? I'm a fan too! Tony was one of my favorite characters." Sometimes, the girl just feels like opening up—which is great for the fans. For instance, in April 2017, she tweeted, "I'm down for #AskLiza but ill only answer questions related to music." One of our favorite revelations was when she named her favorite rappers: Eminem, Kendrick Lamar, Nicki Minaj, Iggy Azalea, and Chance the Rapper. ICYDK, the girl loves to rap—and she can be good at it, too! It's hard not to be smitten by her awkwardness, too. In April 2017, Liza visited San Jose City, Nueva Ecija province to participate in the Pagibang Damara Festival, where she was too nervous to pronounce the festival's name. She tweeted, "Thank you to everyone who came to the PAGIBANG DAMARA FESTIVAL. Ayan I was so nervous earlier I couldn't pronounce it at all haha." She added, "And I kept saying 'we' and 'kami' in my spiels. Not used to being along [sic] on stage anymore. But I enjoyed!!! Maraming salamat uli." Then, there are days when social media can just be too exhausting for this cheerful lady. In June 2017, she posted, "Tired of social media and the verbal abuse celebrities get online." She also posts random thoughts that can inspire her followers. In October 2017, she tweeted, "All I want is to make people happy, and I'm glad I get to do what I love. Goodnight x." Liza and her fellow Kapamilya Anne Curtis made us feel like they were one of us when they tweeted about doing groceries. Anne wrote, "Doing my own groceries is definitely one of my simple joys. I love going down each and every aisle. Kahit wala naman akong kailangan sa aisle na 'yon.” Liza replied, "I feel you hehe." Before the premiere of her TV series Bagani in February 2018, it ran into a few controversies. Many netizens took issue with the fact that the main characters were not of pure Filipino blood: Liza is half-American, while Enrique has German and Spanish blood. In a now-deleted tweet, Liza replied to a netizen to defend herself: "And who says were not pinoy? My Father is full filipino. I was raised by two filipinos since the age of 4. I looooove sinigang i think thats as pinoy as pinoy can get." The tweet went viral and sparked an online debate. Bagani aired from March 2018 to August 2018. In August 2018, Liza made an inspiring announcement: she was back in school. She wrote on Twitter and Instagram: "It's an overflowing joy to be back to school. I am inspired to focus on my studies and pursue my career at the same time. Thank you to @southville_is for being with me in [sic] this journey. #FirstDay #Monarchs #BeAmazingBeSouthville." She is currently pursuing a degree in Psychology at the Southville International School and Colleges.